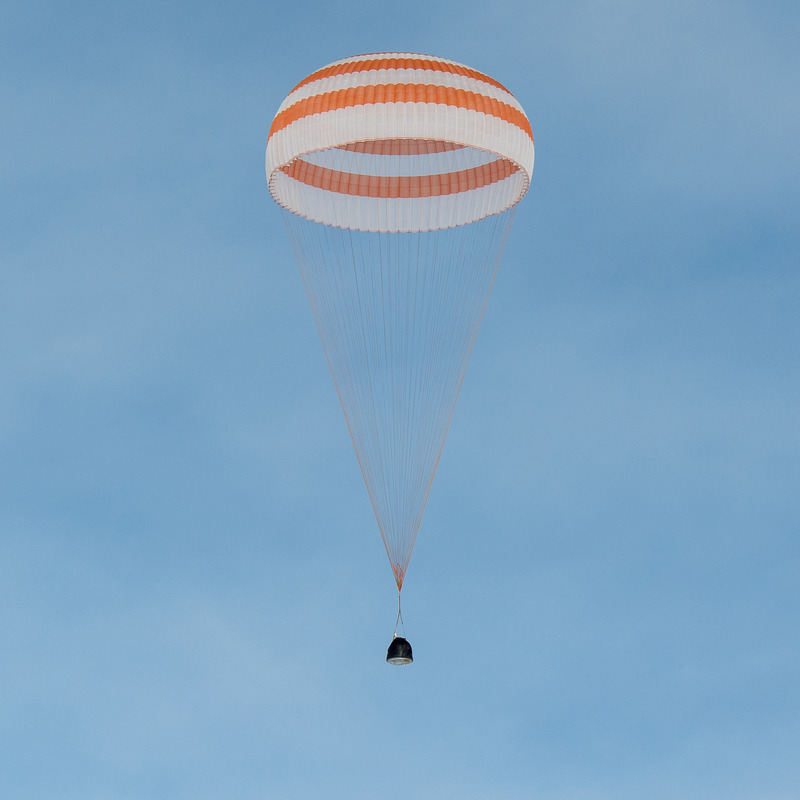 A crew of three parachuted to a safe landing aboard their Soyuz spacecraft on the steppes of Kazakhstan on Wednesday, closing out the Year In Space Mission. One-year crew members Scott Kelly and Mikhail Kornienko returned to Earth after a 340-day flight, making 5,440 orbits around the planet to study how the human body responds to lengthy exposure to microgravity and space radiation. The two were accompanied by Soyuz commander Sergei Volkov who returned after a 182-day mission. The Soyuz trio boarded their spacecraft on Tuesday, closing hatches to ISS at 21:43 UTC to begin the multi-hour process of preparing for undocking and landing. 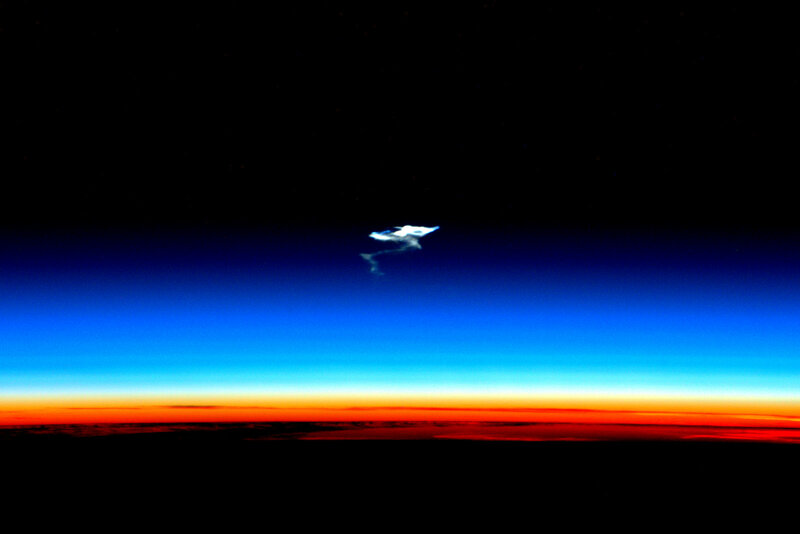 They made an on-time departure at 1:02 UTC Wednesday morning, leaving ISS behind as their Soyuz fired its engines twice to set up an opening rate bringing the Soyuz to sufficient distance before igniting its main engine on its deorbit burn. With no more turning back, the Soyuz split in three as the Entry Module separated from the Service and Orbital Modules just minutes before slamming into the atmosphere for a blazing re-entry. All three Soyuz crew members had previous flight experience on the Russian spacecraft and knew what would await them when rapidly slowing down in the atmosphere followed by a wild rollercoaster ride at parachute deployment and a noticeable landing on the snow-covered steppe in south-central Kazakhstan. Touchdown occurred at 4:26 UTC after a 230-million-Kilometer mission for Kornienko and Kelly. All crew members appeared to be in good health immediately after landing, heading into a lengthy re-adaptation to the pull of Earth’s gravity. The idea of conducting a one-year mission to ISS had been around since the inception of the Space Station, envisioned to become a precursor to long-duration missions to more distant targets Beyond Earth Orbit. ISS has been designed to provide a platform to learn about the conduct of extended space missions and improve technology and procedures based on lessons learned in Low Earth Orbit. As a program, ISS has the overall goal of collecting data on physiological changes undergone by humans during prolonged exposure to the space environment to help develop countermeasures to prevent the well known effects on virtually all bodily systems. Starting with its first Expedition, ISS typically saw crews changing every six months and scientists documented changes undergone by the human body over that period of time, but to assess the progression of negative effects beyond this half-year threshold, a longer mission had to be designed. 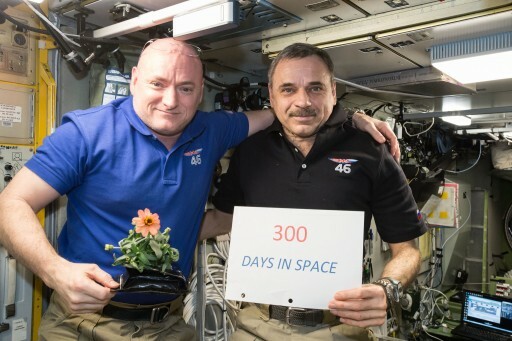 With a duration of 340 days, the “Year In Space” provided researchers with an unprecedented opportunity of studying the medical, physiological and psychological challenges astronauts will have to face when leaving the planet for destinations like Mars or an asteroid. Kelly and Kornienko’s mission eclipses the previous record for the longest stay on ISS at 215 days, but it will not come close to the duration of missions conducted during the Mir days. Missions of one year or longer were performed on three occasions including Valeri Polyakov’s record-setting flight of 438 days. However, these Mir missions could not gather nearly as much data as is possible through the use of today’s technology and experiment facilities established on ISS, making Kelly and Kornienko’s mission an unprecedented scientific study. Chosen for the job of spending nearly a full year in space were two veterans, both with experience in long-duration space flight. 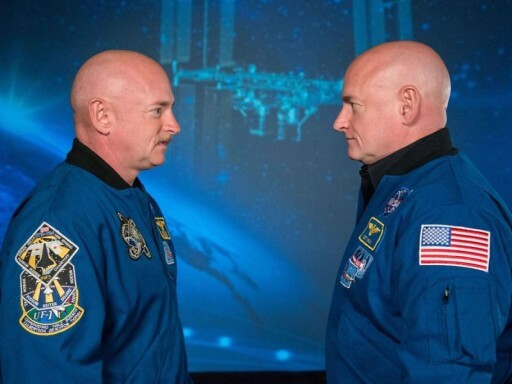 NASA’s selection of Scott Kelly brought an additional research opportunity in the area of genetics as his twin brother and former Astronaut Mark agreed to a study involving the two brothers during a three-year period to look at possible genetic changes in the twin exposed to the space environment for an extended period of time. The two Kelly brothers have been collecting samples and undergoing tests starting one year before Scott’s launch and sample-collection will continue for another year after Wednesday’s landing. The Kelly brothers were selected by NASA in 1996 and both started out in the Space Shuttle Program with Mark commanding and piloting four Shuttle missions while Scott flew missions to the Hubble Space Telescope and ISS before transitioning to the ISS Program to begin training for a long-duration mission. 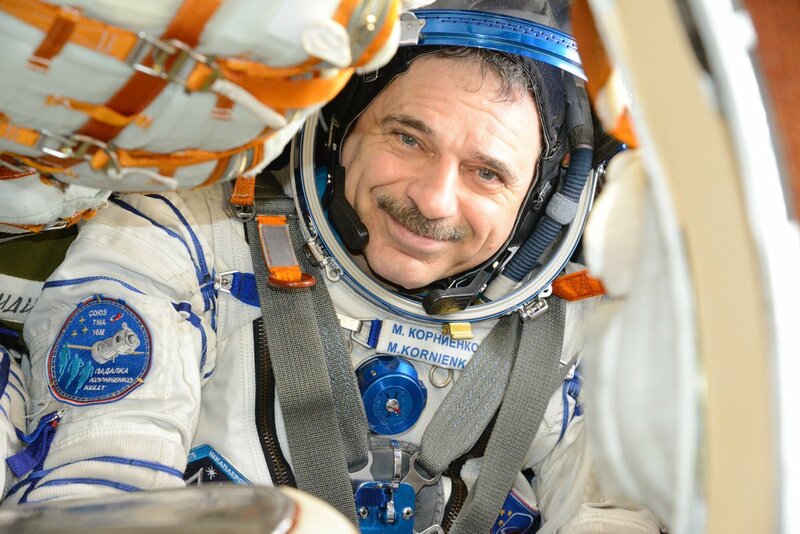 Scott was part of Expedition 25/26 in 2010 bringing his total time spent in space to 180 days. It was not long after his return from ISS that he was selected for the one-year mission to be accompanied by a Russian Cosmonaut selected by Roscosmos. Mikhail Kornienko comes from a military background before beginning a career in engineering, working for Russian aerospace companies until being selected as Cosmonaut in 1998. He was part of two backup crew assignments before flying to space in 2010 as part of Expedition 23/24, logging 176 days in orbit. 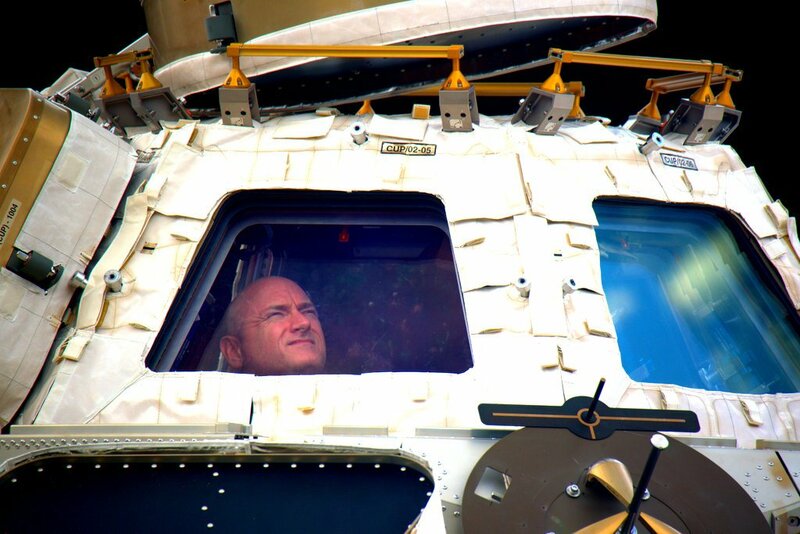 Scott Kelly and Mikhail Kornienko embarked on their space adventure on March 27, 2015 lifting off aboard the Soyuz TMA-15M spacecraft commanded by Gennady Padalka. They arrived at ISS on the fast lane and settled in for an eventful mission that would see great success as well as tremendous challenges. Over the course of their stay, Kelly and Kornienko made 5,440 orbits around Earth, seeing nearly 11,000 sunrises & sunsets and covering over 230 million Kilometers, just around 15 million Kilometers short of a flight to Mars and back. 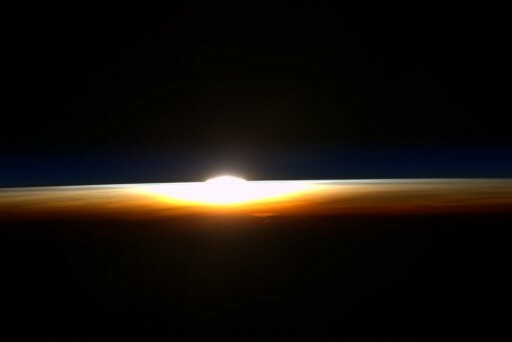 Scott Kelly shared this photo of his last sunrise seen from the Space Station. Their main objective was science, spending several hours per day collecting samples from their bodies, undergoing different tests to document changes in different bodily systems including their eyes, the cardiovascular system, the distribution of fluids in their bodies, their bodies’ microbial population and many more. They also completed sleep studies, tested their cognitive abilities, kept journals and assessed the systems of ISS from a habitability standpoint in an extended mission. 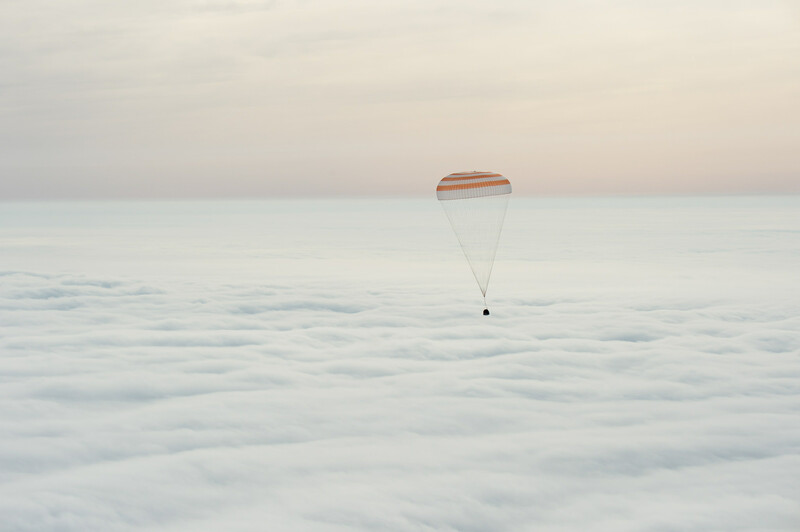 Their mission saw the arrival of three crewed Soyuz spacecraft as well as six cargo resupply craft. One of the biggest challenges faced by the ISS program during the crew’s stay was the loss of two cargo vehicles – the Russian Progress M-27M in April and the SpaceX Dragon CRS-7 craft in June causing shelves on ISS to slowly go empty with three of the program’s cargo providers in extended stand-downs after failures. 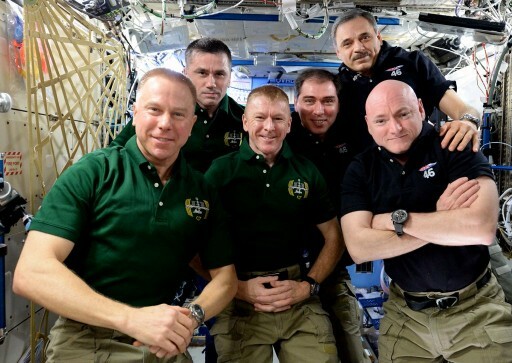 However, no one had to go to bed hungry aboard ISS and business continued as usual with the one-year crew also completing experiments in areas other than human research, amounting to a total of 450 studies completed on ISS in the past year. Kelly and Kornienko also participated in spacewalks – three were performed by Kelly and Kornienko ventured outside once. At the halfway-point of the ‘Year In Space,’ ISS saw a direct handover between crews because Kelly and Kornienko had to switch from one Soyuz craft to the next – a requirement arising from the limited in-orbit service life of the Soyuz that can support half-year missions but is not certified to remain in space for a full year. Gennady Padalka departed in September and the one-year crew members transitioned to Soyuz TMA-18M flown to ISS by Sergei Volkov and two short-duration visitors who landed with Padalka. 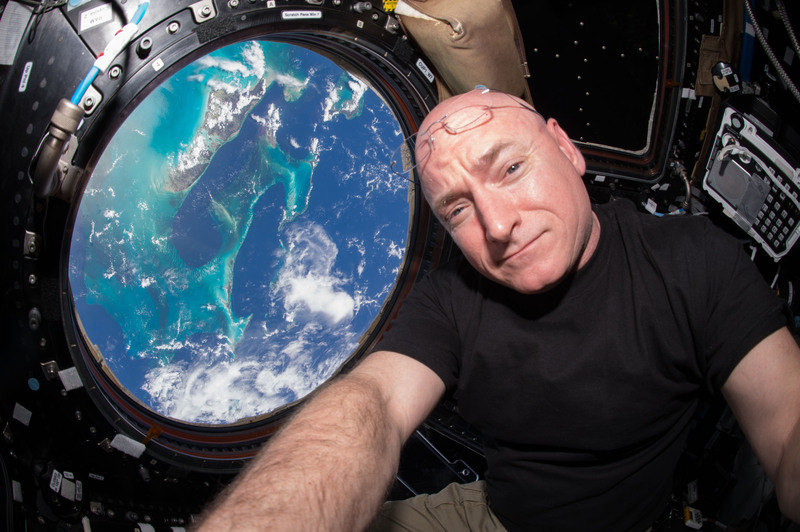 One steady companion for Scott Kelly over the course of his flight was the camera. He snapped thousands of photos of Earth and shared pictures of Earth and ongoing activities on ISS with nearly one million followers on Twitter and other social media sites, also answering questions from the public. Packing up after over 11 months aboard ISS, the one-year crew members along with their Soyuz commander went through a number of preparatory steps for their return to Earth – including a changed exercise regiment to get ready for their return to gravity. The Soyuz TMA-18M spacecraft was checked out last week and the three crew members went through landing simulations and checked the fit of their Sokol Launch and Entry Suits. Scott Kelly handed command of ISS over to Tim Kopra on Monday after having been the commander for three Station Increments, also marking a first. The crew spent their last night in space, having a chance to sleep in on Tuesday to be able to support their overnight return. The Soyuz TMA-18M spacecraft was powered up for final checkouts and the Expedition 46 crew gathered inside the Poisk module to say their farewells as the three departing crew members boarded their Soyuz, leaving Kopra, Yuri Malenchenko and Tim Peake on ISS to head into Expedition 47. Once the hatch of the spacecraft was closed, the crew went through the prescribed leak checks, put on their suits and strapped themselves into their seats inside the Entry Module that was sealed off from the Orbital Module ahead of undocking. Soyuz TMA-18M set sail at 01:02:40 UTC on Wednesday, drifting away from ISS at a gentle pace before firing its thrusters twice in a modified departure sequence that allows ISS to remain in its nominal attitude, saving propellants by cutting a maneuver to a specific undocking attitude. The Soyuz first accelerated along the R-Bar, flying towards zenith (deep space) before re-orienting and firing its engines again to depart along the Velocity-Vector, the standard departure path for the Soyuz. Over the next two and a half hours, the crew aboard the Soyuz completed the necessary steps to set up for the fast-paced events of Entry, Descent and Landing, but also enjoying a few final views out the small Entry Module Windows. At 3:32:40 UTC, the Soyuz began a computer-orchestrated deorbit burn to drop the capsule out of orbit, firing its 300 Kilogram-force SKD propulsion system for four minutes and 42 seconds to slow down by 128 meters per second, just enough to place the Soyuz on a path towards the dense atmosphere. The burn was very precise, setting the Soyuz on a course to re-entry with the entry location and angle carefully set up to allow the craft to reach its landing site in south-central Kazakhstan. With no more turning back, the crew closed their helmets and watched over the systems of the Soyuz as the Orbital Module was depressurized ahead of the separation of the three Soyuz modules at 3:59 UTC when the vehicle crossed 140 Kilometers in altitude. At that point, recovery forces were in the final stages of deployment to the primary landing site and the ballistic site, 400 Kilometers short of the intended landing target. A 300-strong team from RSC Energia and all involved space agencies headed to the landing zone in offroad and all-terrain vehicles as well as a fleet of Mi-8 helicopters while two Antonov aircraft started circling the landing zones to act as airborne command centers. 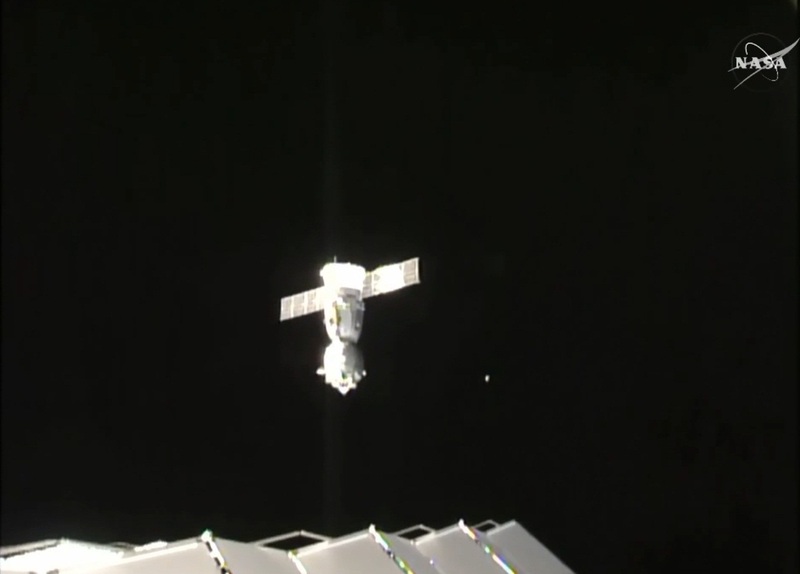 Soyuz hit the atmosphere at 4:02 UTC when passing 100 Kilometers, crossing the border between Iraq and Iran. Flying 7.7 Kilometers per second, Soyuz was programmed to hold its initial re-entry attitude for 90 seconds before initiating a series of bank maneuvers and modifying its lift to home in on the precise parachute opening target. Communications with the craft deteriorated as has been the norm for most of the recent Soyuz landings. For the crew, coming back after extended weightlessness, re-entry can be quite a strenuous experience, pulling in excess of four Gs when Soyuz is rapidly slowed down in the atmosphere. Soyuz deployed its parachutes 10.7 Kilometers in altitude, starting with a pair of Pilot Chutes that pulled our the larger Drogue, inflating at a speed of Mach 0.7, leading to wild oscillations of the Soyuz capsule under the chute, persisting for about 30 seconds before the flight stabilized. 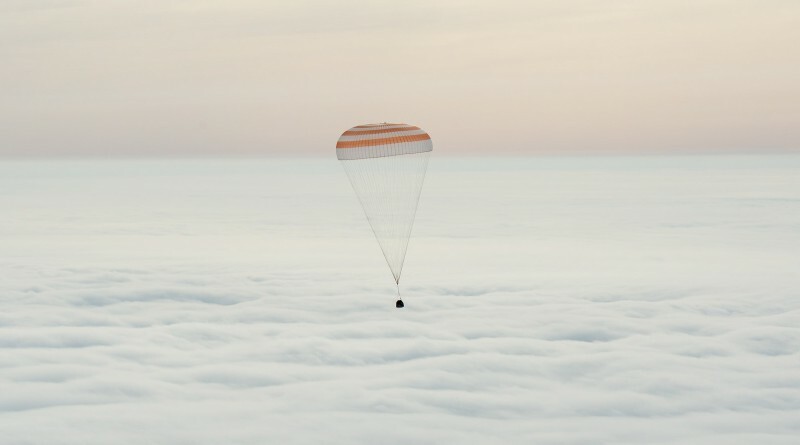 Next, the large orange-and-white main chute was deployed, slowing the craft down and transitioning to a vertical descent, marking the start of the landing program that saw Soyuz drop its heat shield, vent its tanks, jettison the blackened window coves and moving the crew’s Kazbek seats upwards so they could absorb some of the shock at landing. Soyuz touched down on-time and on-target at 4:26 UTC as the solid-fueled soft landing engines cushioned its impact on the snow-covered steppe, safely bringing home a trio of experienced spacemen. The capsule came to rest in an upright position and recovery teams were quick to reach the vehicle to begin the process of opening up the hatch and helping the crew outside. Commander Sergei Volkov was first to be pulled out of the vehicle, returning after his third long-duration mission to ISS, now with 548 days logged in orbit. He appeared to be in good physical condition and was eager to tell recovery teams and the media about the crew’s successful re-entry. 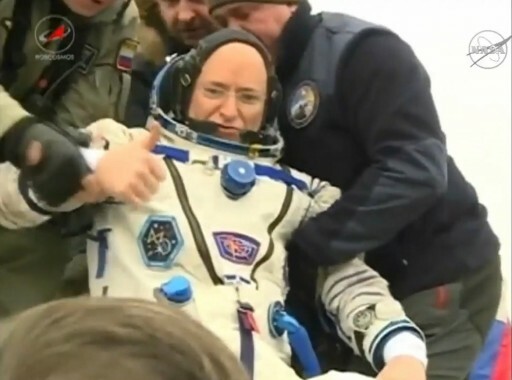 Next out of the Soyuz was Scott Kelly, appearing to be dealing with the pull of gravity rather well after having just returned after a year in weightlessness. His total time spent in space now stands at 520 days and he can look back at three spacewalks conducted as part of his long-duration flight. 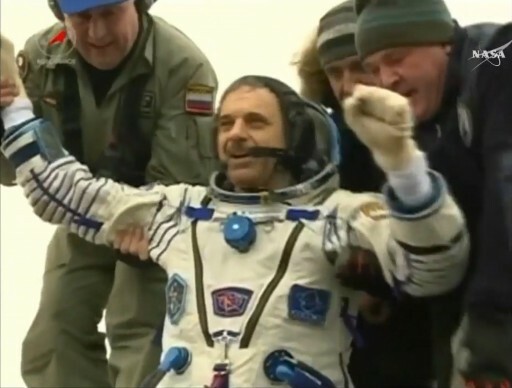 Mikhail Kornienko, last to exit the Soyuz, also seemed to be in relatively good physical condition and happy to be back on the ground, now having spent 516 days in space as part of his two stints on ISS. 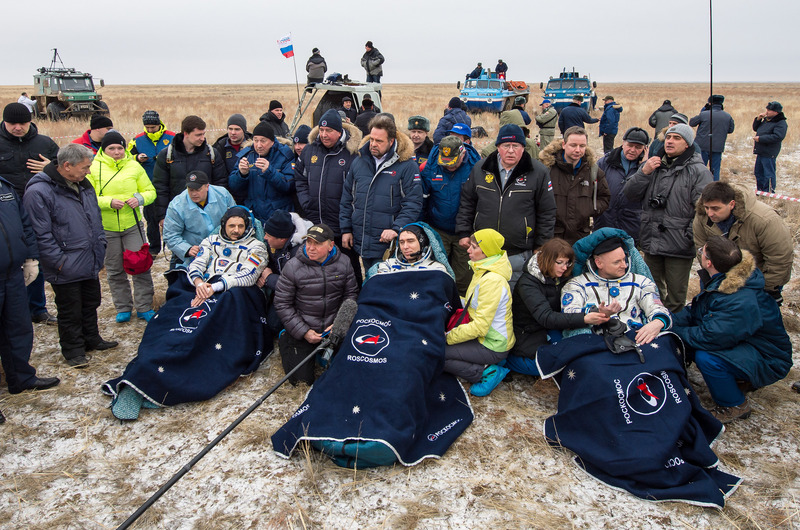 All crew members were seated in reclining chairs next to their Soyuz, getting a moment to enjoy a breath of fresh morning air. They posed for a photo opportunity and were able to make short phone calls home before being carried off to the medical tent set up at the landing site. Scott Kelly and Mikhail Kornienko did not get much of a break as researchers needed to gather data on their physical abilities immediately after returning to a gravity environment in a quest to learn what types of tasks could be completed by a crew in the minutes and hours after landing with obvious implications for future Mars missions. As part of an hour-long Field Test performed in the Medical Tent, the crew will complete physical exercises such as standing up from a sitting position, a recovery from fall test, balancing while standing on both feet and a number of other tasks. Of particular importance for the one-year crew members, these experiments will assess the complexity, severity, and duration of physiological changes that have noticeable effects on a crew member’s health when returning to a gravity environment. The Soyuz crew will depart for Karaganda around two hours after landing where they will part ways as Scott Kelly boards a plane to Houston and Volkov and Kornienko depart for Star City. All crew members will go through two months of rehabilitation, continued sample collection and testing as well as debriefings, but Kornienko and Kelly will be the subject of tests for at least another year to maximize the knowledge gathered from their pilot mission.